Daytona Sportswear has a professional in-house art department that specializes in producing original t-shirt art, logo design, and color separations. Creative, unique, and custom! The art department can develop exclusive and unparalled designs to be printed or embroidered for your business, church, school, organization, sports team, league, reunion, club or group. Artwork can range from one color to full color, and be as simple or as ornate as you like. Art proofs make it convenient to determine if the design is right for you. It is our goal to produce original designs that will Get You.... Noticed! LET US CREATE SOME ART FOR YOU! Art is billed at $45 an hour at a minimum of 1 hour per design. The price includes any art created for the screen printing job, separations and film for screens. Email us your art or idea and allow us to give you a free quote! Check Out Some of Our Custom Artwork! Do you have a design that you would like to see screen printed? Well that's no problem either! See below for information to help you supply us the art that will get you the best quality print! VECTOR ART: Adobe Illustrator (.ai), Corel Draw (.cdr), and EPS files. Please convert all type/fonts and strokes to paths and outlines prior to submission. Must be provided at the actual print size. RASTERIZED ART: TIFF files, Photoshop (.psd) files, and PDF files must be submitted in 300 dpi/ppi and at actual print size. Layers are preferred, as they can save time on separations, and decrease art time/cost. Please email all art to the art department using our contact form or, or you can drop off the high resolution digital file at our office. 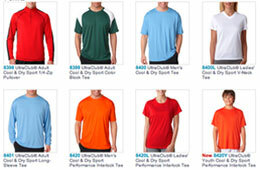 Be sure to specify all shirts, shirt colors, sizes, as well as preferred print locations on the shirt. If there are any PMS/PANTONE colors in the design- please be sure to provide us with the PANTONE number so we can match it appropriately. 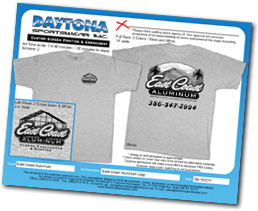 Daytona Sportswear will make every effort to duplicate PMS colors, or colors represented in supplied art, however exact color matching is not guaranteed. Art proofs will be supplied to the customer for approval. Art must be fully approved and a deposit must be paid before any art can go to press. Please be sure to e-mail "ART APPROVED" to the art department once the art is officially approved. Or print out, sign, and fax back your proof to 386-252-2535. A sign off on a printed proof in the shop is also acceptable. Once the art is approved, Daytona Sportswear is no longer responsible for mistakes or issues found in the art. Full Back: The general print dimensions for the back of a shirt is 14" w x 14" h, but we also have an oversize print size that can be 14" w x 17 h."
Full Front: Front prints are usually recommended to print at 11" w maximum for regular shirts, though we can still print 14" w, it is not recommended since it can wrap under the arms on smaller shirt sizes. Left and Right Chest: LEft and Right Chest prints are 3.5" w on average, give or take a little. We can print as wide as 5" if the design is going on non-pocketed shirts. On-pocket prints are sized to a maximum 3.5" wide and high to fit safely within the stiched area of the pocket. Youth Sizes: To use all the same screens for order that contain both adult and youth sized shirts, the print size will be determined by the smallest youth shirt. 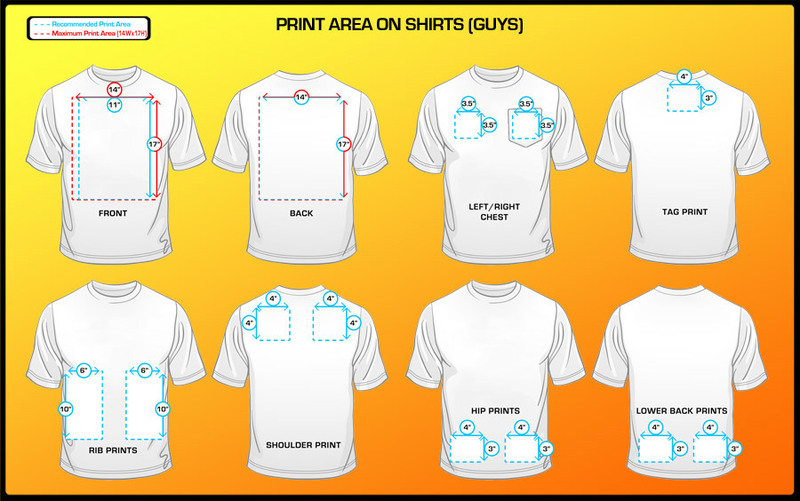 If the maximum print size is desired for both regular and youth shirt sizes, an extra set of screens will have to be made. Youth full front prints generally print at 11" w x 15" h, and the backs print at 13" w x 15" h for the maximum print area. Ladies Shirts: Ladies tanks and tops generally run much smaller and the max print area for these tops extends to approx 10.5" w x 14" h for both the front and back print. 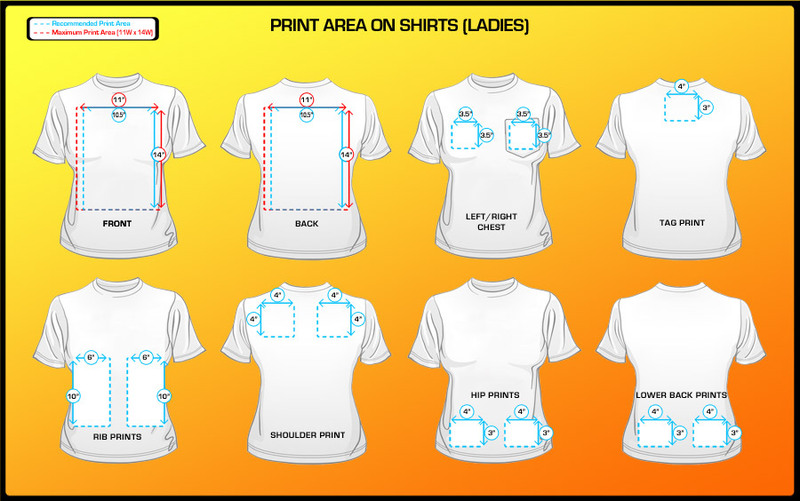 Ladies front prints are recommended to print at 6" - 8" wide. Sleeves: Sleeve prints need to be specified for long or short, and right, left or both sleeves. Short sleeve print area is 3.5" w x 3.5" h (with exception of some ladies and youth sizes) , and the long sleeve print area is 3" w x 16" h.
Coolies: Be sure to specify whether a front and back print is desired, or if a one-sided coolie logo is preferred. Also verify whether you prefer bottle coolies or can coolies, or both. Print size for can coolies is 3" w x 3" h. Bottle coolies print 3" w x 3.25" h (one side only for bottle coolies). If you are interested in using the art we have designed for you for printing on alternative materials, check with us to see what other specialty items and promotional products we may have available for you. However if you have an alternative source and you would like to use the art we have provided for you here- you may purchase an art cd from us. The art cd will include your art or logo set-up in a multitude of printable file formats and is priced at only $25.